Tony Sparks, The Godfather of Comedy, brings his comedy and best of the Bay comedians with him for a night of stellar stand up comedy. Come see Nightlife on Mars in action, and attend the show SF Magazine calls, "Best Underground Comedy Show in San Francisco." Sign up at 5:30pm. Runs 6-8pm. The comedy show you’ll be writing in your diary about for years to come. 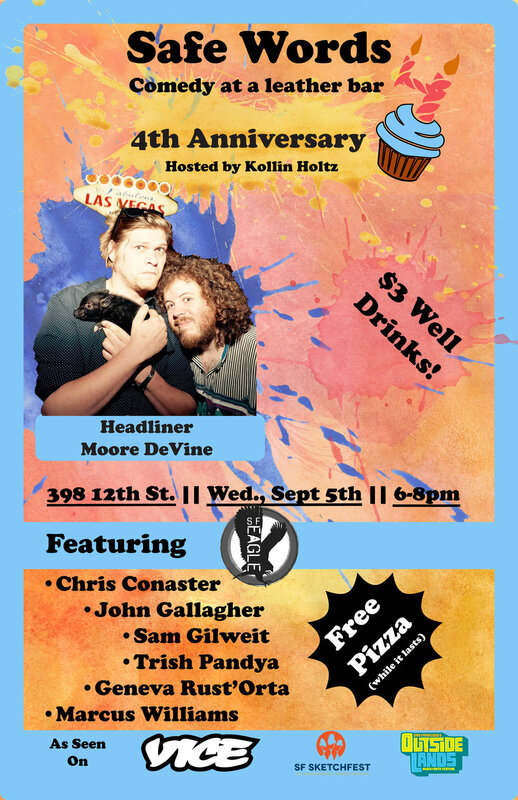 Safe Words rings in its four year anniversary with a stellar line up, $3 well drinks, beer starting at $2.50, and complimentary pizza for as long as it lasts. Featuring nationally touring comedians, & performers from around the bay.